As always, just when things seem to be at their most bleak, just as it seems like the curtains are just about to ring down around Tank Girl’s head, a little twist of fate keeps her and her companions from biting the dust. 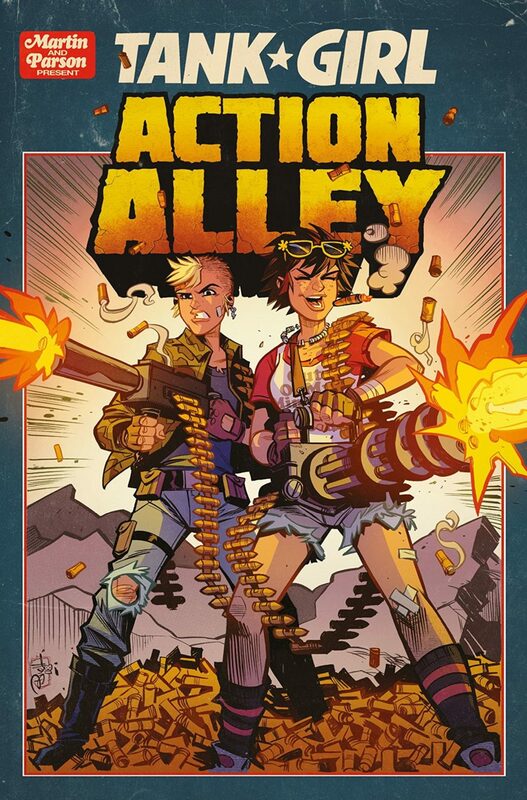 So it goes in the third issue of Tank Girl Action Alley, in which the colorful, electric report of weapon fire is halted by a brand new revelation. Saved by their skins of their teeth from death, Tank Girl and the others are taken by the mutants to their leader. He promptly reveals the gristly origins of Jet Girl’s favorite meat brand/fast food conglomerate, Marsofu (hint: the name is very indicative of its origins). It seems the mutants are a result of corporate tampering which turned them from ordinary humans into semi-intelligent ape hybrids, and that the evil corporation has a location just around the road. The slim hope that the Marsofu corporation might have the power coupling they need to put them back on the road—and reunite Tank Girl with her dying adoptive mother—sends the team on the ultimate quest for truth, justice and marsupial liberation. Brett Parson’s art really carries this issue to life; I love the rounded, mischievous tone of the linework, when contrasted with the totally disastrous violence that plagues Tanky throughout her life and the simplest of tasks. Not that protecting Booga’s sort-of-kangaroo girlfriend from gunfire as they break into a deadly Soylent Green-esque food plant is anything but perfectly ordinary in TG’s world. That there’s a twist with Barbara and she turns out to be an all-right kind of gal is the kind of moment that only Tank Girl could deliver on, and deliver it does in a way that gets you giggling. Booga also has some great moments but TG really is the glue holding this issue together in a commanding way. Zulu gets to be brave and smart, Booga gets called on his infidelity crap, and the issue indulges in some really awkward visual Holocaust imagery that feels boundary shoving even for a Tank Girl book. Light and dark, funny and pointed, colorful and muted, all of these ideas meet and clash within the colorful skin of this latest volume. I have to give another shout-out to Brett Parson’s multi-tasking here. While the Martins’ entertaining writing has been growing the base idea of the book along with each issue and producing humor with some character observations, Parson’s art has gotten more interesting over the last couple of issues. Perhaps it’s the very careful use of colors, or the creative lettering, but it definitely manages to grip on and hold the reader’s attention in a memorable way. His zombie creatures are terribly entertaining to look at. 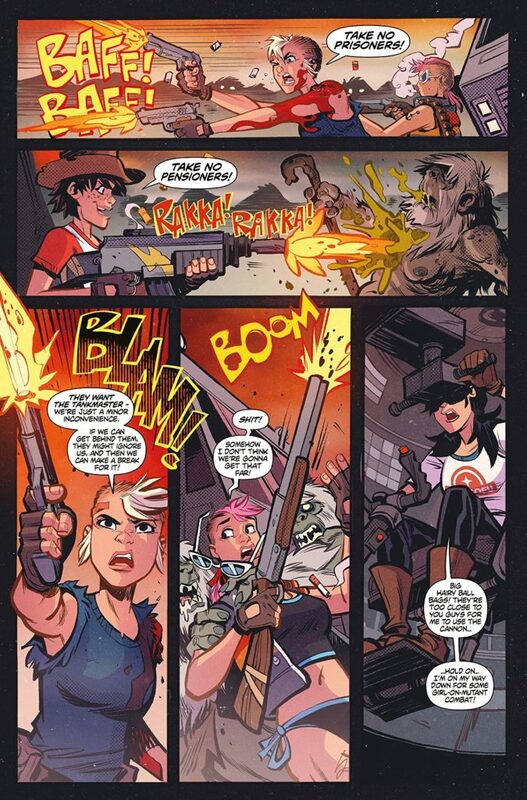 There’s something to be said for the cohesiveness of maintaining a small staff, and Tank Girl’s spirited sense of enterprise definitely reflects that. 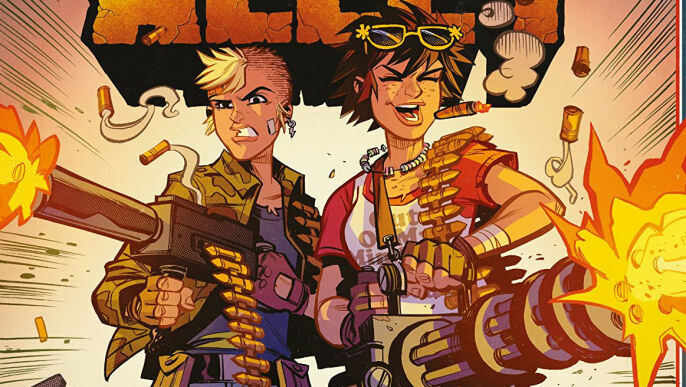 With yet another exciting cliffhanger in Tank Girl Action Alley #3, we’re left to wonder if their luck will truly last.